PSD direct drives from halstrup-walcher not only incorporate a stepper motor but all the relevant sub-systems for automatic format changeovers. Whenever a new format is required, they automatically move guide rails, tools, or even inspection cameras to the correct position in the machine. Drives from halstrup-walcher impress with their compact design (Nema 17 and 23) and operate at speeds of up to 1000 rpm - ideal for frequent adjustment of machine axles when working with small batch sizes. The system is mounted directly on the spindle using a hollow shaft with integrated torque support. This eliminates the need for a coupling. A gearbox perfectly adjusted to the system requirements offers more torque of up to 8 Nm when you need it. The compact drives are highly flexible. Two different alignment options for the connectors enable them to be integrated without angle plugs. The hollow shaft is also supplied mounted in 4 possible directions of rotation. The absolute measurement system requires no battery, no reference runs before positioning, and no additional maintenance. 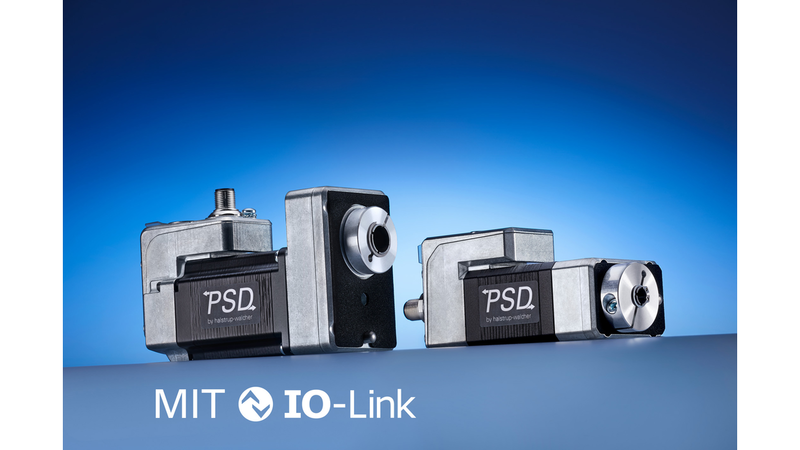 The PSD direct drives are controlled via an IO-Link interface and thus offer further advantages: In addition to run commands for controls, the interface allows large quantities of feedback data to be read out from the drives (condition monitoring) and used for predictive maintenance of the machines - in combination with data from other IO-Link sensors. The connection concept is cost-effective and flexible. The drives are connected using only an unshielded 3-core cable with IO-Link master and can then be implemented on any customer-specific field buses. halstrup-walcher is the first drive technology manufacturer to supply integrated direct drives with IO-Link interfaces. This further underlines the company’s ambition to develop networked machines with integrated drives - an important step towards Industry 4.0.